Gathering Strands is a multi-layered exhibition project celebrating the vitality of Indigenous fibre work by bringing together Aboriginal and Torres Strait Islander weavers, visual artists and community groups from across South East Queensland. Curated by Freja Carmichael, recipient of the 2014 Australia Council Emerging Curator’s Fellowship, Gathering Strands has been the culmination of a two year journey that has embodied a strong focus on strengthening practices locally, and offering connection through fibre based traditions. Fibre and weaving work has a long and enduring history in Indigenous cultures, and the exhibition covers a broad range of mediums and themes to highlight continuous cultural links to fibre based traditions. Threads from the past are interwoven with the present, as stories and histories are shared, techniques are reclaimed and new approaches are embraced through woven and sculptural forms, prints, paintings, installations, collaborations and digital works. The exhibition also includes historical fibre works relating to contemporary interpretations, commissioned pieces and Redland Art Gallery collection works. This project has received financial assistance from the Queensland Government through Arts Queensland’s Backing Indigenous Arts program and the Gordon Darling Foundation, and is supported by QYAC. 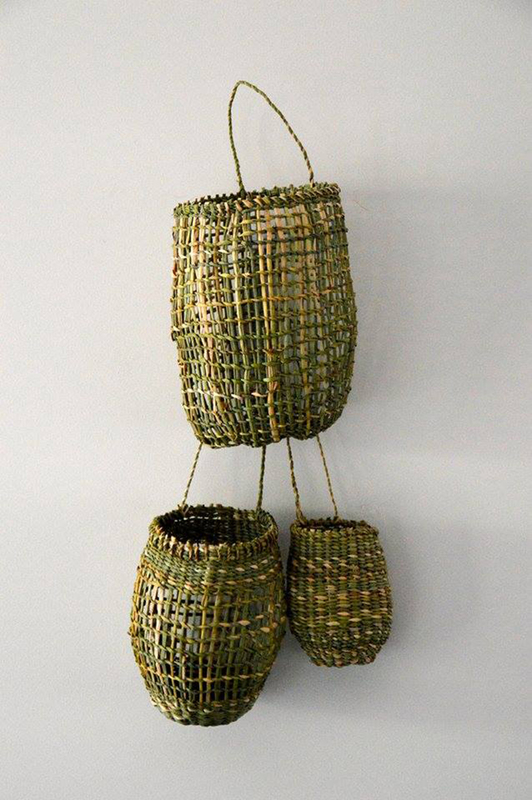 Image: Chantal Henley, Together again 2015, Un-gaire (swamp reed). Courtesy of the artist.